You might remember me mentioning in a few blog posts about my sister, Violet, having a very rough pregnancy, being hospitalized a few times even, due to having incredibly bad Hyperemesis Gravidarum (HG), extreme nausea of pregnancy. I didn't have the easiest pregnancies in terms of nausea, etc... and I was puking occasionally throughout the 9 months of all three of my pregnancies, but in comparison to my sister's pregnancies, I was healthy as a horse. Visiting my sister in the hospital made me realize just how lucky I was to only have bad nausea, and not terrible, debilitating, dangerous nausea like my sister had. Fortunately, at the end of a very long, and very eventful pregnancy, my sister gave birth to a baby girl... in a moving vehicle on the back seat of my father's car on the way to the hospital, and now is on her way towards recovery from her 9 months of starvation. Today is the First Annual Hyperemesis Awareness Day, and my sister asked if she could write a guest post on the subject of Hyperemesis to help spread awareness. 90% of pregnant women experience morning sickness in some form or another. Regular morning sickness is referred to as NVP- Nausea and Vomiting during Pregnancy. Hyperemesis on the other hand is severe morning sickness, so severe that often the mother is unable to eat or drink ANYTHING. She has to deal with weight loss, dehydration, malnutrition etc. Many potentially life threatening complications can arise if left untreated or undertreated. HG affects approximately 1-2% of pregnant women world-wide, in various degrees of severity. Some woman only require IV hydration a couple of times, while other cases are so severe, for example, that in 1855, Charlotte Bronte, the author of Jane Eyre, died of starvation and dehydration, when she was 4 months pregnant. Late August this year we hosted a family memorial service at my home (it was the anniversary of my husband’s mother’s death). Close to 60 people showed up. Being that frugality runs in the family, I spent the week beforehand cooking and preparing all the food on my own. Two days after the event, I woke up one morning with nonstop vomiting, unable to keep anything down. Oh no, something I had made had given me food poisoning! But I had made such a large number of various foods, I had no idea what to even suspect. Yet after a couple of days, the vomiting didn’t stop. I took a pregnancy test, and lo and behold, it was positive. I had had bad nausea my previous pregnancy, so I called my doctor, told him I had the medication Reglan at home from my previous pregnancy, and if I should start taking it now. He said yes, and so I started taking it. I made my 9 week appointment with my doctor and continued to assume the pregnancy was progressing ‘normally’. Yet the medicine was not helping, and I still was unable to keep down any food or drink. I continued going to work at the library for about a week, but spent all my time there lying on the floor behind the librarian’s desk with no energy to even sit up. In the end, I simply quit my job and left, because I couldn’t function. My father (a doctor) would come by every two to three days and would give me an IV at home. That’s what I survived on for a month. I would lie on the couch every day doing nothing, no energy to stand or even sit up. After a month, I went in to see the doctor for my regularly scheduled appointment. My aunt drove me to his office. It was about a 20 yard walk from where she dropped me off to the entrance of the office. I barely made it into the building before I fainted from a combination of malnutrition and dehydration. I had been able to keep down nothing, neither food nor drink, not even a small sip of water, for four days. To make a long story short, my doctor called me an ambulance and I was hospitalized. I spent the next month in and out of the hospital with constant round the clock IV hydration. I was given IV Zofran and Zantac to help with the nausea and vomiting. Once I was able to keep pills down, I was able to go home. Although I still couldn’t eat or drink, with the medication I was however, able to have a very small sip of juice/tea every 15-20 minutes. At first, I didn’t go in for regular IV’s, but after having serious early contractions twice, I started to go in for IV’s about once a week or every time I felt I was really dehydrated. This lasted the entire pregnancy. Instead of gaining weight during the pregnancy, I lost 15% of my pre-pregnancy body weight. I didn’t have severe Hyperemesis during my first pregnancy and was therefore able to mostly function throughout my first pregnancy. Looking back on my first pregnancy I would say I had a very mild case of Hyperemesis, but this pregnancy has been extremely difficult and worthy of the title “severe Hyperemesis.” Not everyone who ends up getting Hyperemesis during pregnancy gets Hyperemesis the first time, but others do. Many are like me and have a mild undiagnosed Hyperemesis pregnancy for their first or even second pregnancy, but find the “morning sickness” gets worse and much more extreme with each subsequent pregnancy. How does a person know if what they have is HG or NVP? Some of the common signs of Hyperemesis are as follows. The following table from HER foundation (Hyperemesis Education and Research) helps you know if it is just regular morning sickness or Hyperemesis. Being that this is a blog on frugality, here are some pieces of advice on how to deal with Hyperemesis. No matter how frugal you are, HG is expensive. The inability to work means the inability to bring home income. If you have kids, you often have no choice but to pay for childcare. Plus health expenses and childcare add up to quite a lot. Many HG families will simply order take out for all their meals because often the woman with HG is too ill to do even the most basic daily tasks and the odors emitted during cooking can sadly lead to excessive vomiting spells. Between reduced or lost income, extra childcare expenses, and an increase in food expenses, the total cost can add up to quite a lot. When cooking, try to cook a large amount at once (my husband did this). Then freeze meal size portions of the food. That minimizes the effort/time on the part of your significant other. I found that there was so much to get done around the house. Because of my acute sensitivity to smell, we had to constantly be on top of the house-cleaning, amongst the regular daily chores. Often there weren’t enough hours in the day to make it to the cheaper grocery store on a regular basis. We had to resort to going to the expensive mom and pop corner store. What did we do? We stocked up on non-perishables; enough for all 9 months. Canned corn, beans, tuna and peas, plus instant mashed potatoes, all made up the main dish for many of the meals my husband ate. It may not be the most frugal of meals, but it is still a lot cheaper then takeout. Don’t overdo it and try to be a super mom. One afternoon, I decided my husband deserved a break. So I got up, and with great difficulty cooked some simple food on the stovetop. The energy exerted in addition to the dehydration, caused early contractions and I ended up being rushed to the hospital by ambulance. Yeah, takeout is expensive, but it still would have been cheaper than that hospital visit. I offered this piece of advice to a woman who knew she could not afford childcare for her daughter. Have a partial round robin. Her mother was willing to come twice a week and watch her daughter for 5 hours. I suggested her mother also watch a second baby at the same time, and in return, that neighbor would take her daughter twice a week. If your spouse has one day off a week, have him watch a neighbor’s child, and then that neighbor takes your child a different day. If you have a neighbor, family or friend with Hyperemesis there are many simple things you can do to make it easier. You can make a large meal for your family. Take the untouched leftovers and bring it to them. Yes, the expecting mother will not be eating anything, but her family still needs to eat. Any cooked meal you can bring over is extremely helpful. Even if the husband has time to cook, often the smell of the cooking food can send the mother into vomiting fits. Daily household chores become impossible to do. So walking the dog, moping/sweeping the floor, taking out the garbage, washing dishes, picking up groceries, and driving her to appointments, are all things that can be done easily in an hour, yet for the expecting mother, can be extremely difficult on her own. Also, there is a research study being conducted by the HER foundation in collaboration with the UCLA on the genetics of Hyperemesis. Current 2007-2015 Study: Genetics of Hyperemesis Gravidarum (HG) HG Researchers need your help! This study is designed to identify individuals affected with HG, to study epidemiologic factors via an online survey, to collect DNA samples from saliva through the mail at no cost or travel for you, and to search for genes and risk factors that may be potentially associated with this condition. To be eligible, you must have suffered from HG and had treatment for your HG that includes i.v. hydration, TPN or other form of non-oral feeding (ie nasogastric feeding), OR both, and are able to recruit a friend with at least 2 pregnancies who has NOT suffered from HG to serve as a control. If you live in the United States and are interested, please contact Marlena Schoenberg Fejzo, PhD at nvpstudy@usc.edu or 310-210-0802. From what I have heard, they really need women to participate in the control group. So if you have had two non-HG pregnancies, participating in the study can really help in the search for more information about HG. This includes filling out a questionnaire, accepting a half hour phone call interview, and sending back a small sample of salivia in a container that will be mailed to you. There is no cost to volunteers and all expenses are paid by the research grant. We as woman love to offer advice. Here are some pieces of advice I was given and why they were unhelpful. "Instead of eating three big meals a day, try eating 6 small ones/ Make sure to eat a balanced diet." If a person throws up everything they eat or drink including the tiniest morsel of food, having 6 small meals instead of 3 is not going to make a difference. Eating a meal is simply an impossible task. "Just try one sip of water." When the nausea is really bad, having a sip of water can often make matters worse rather than better. It can cause stomach bile to be vomited; causing more liquid to be lost than what was taken in that one small sip. "Try eating a cracker." Same as with water, at times of severe nausea, eating can often do more harm than help. Crackers on the other hand, have rough edges, and can scratch the esophagus on the way up. Eventually, tears can inflict the esophagus, brought about by too much vomiting, also causing blood to be vomited in addition to just bile. "Try taking a walk in the fresh air." When one doesn’t have energy to sit up due to malnutrition/dehydration, taking a walk is an impossible task and many with HG find that lying still is the best solution to reduce or even avoid vomiting episodes. "It’s a state of mind"-I once had a friend tell me that if I tried meditation the constant dizziness would go away. The dizziness is real; it is not a state of mind. Dizziness from dehydration is real and serious. It is not something that can be thought away. Neither can the vomiting or nausea. "Well at least you lose weight"- When losing weight, you are trying to burn extra fat. When your body goes into starvation mode and starts producing ketones, the main source of energy for your body is the muscle mass that it burns. This leaves you weak with inablitity to get up and move around easily. Since I gave birth, I may have lost weight, but I have also needed physical therapy to regain my strength and rebuild that muscle mass. Starvation is a terrible way to lose weight. Many other things helpful to women who have normal morning sickness (NVP) do not work for women with Hyperemesis. Ginger, seabands etc. I guarantee you, if we could get this to stop, just eat one small bite, or just sip a small amount, we would. No one wants this to end more than a woman with Hyperemesis. The best way to help is to ask what you can do to help. Most likely any advice you would want to offer has already been tried and was a failure. Hyperemesis is a disease in which doctors/researchers are still searching for a cure. Despite everything I went through with the pregnancy and the birth, I now have a beautiful daughter whom I love and cherish. http://www.helpher.org- A website with the largest wealth of information on HG. Run by the HER Foundation (Hyperemesis education and research). It contains numerous pages of information, in addition to neatly laid out forum for asking specific questions with anything from Medications to advance preparations to long term effects. http://beyondmorningsickness.com- The book Beyond Morning Sickness by Ashli McCall, I have found to be one of the best information resources out there. Medication lists, guides for doctors, family members and the mother herself. There is also a picture book “Mama has Hyperemesis” aimed at explaining to kids why their mother is sick. In addition, they have volunteers who were extremely helpful and supportive to talk to throughout the pregnancy. HG is emotionally traumatic and the volunteers really helped me to deal with it. http://community.babycenter.com/groups/a986645/hyperemesis_sufferers An online forum for with other mothers who have Hyperemesis. Often it helps to be part of a group of other women going through the same thing who understand you better than people around you. http://community.babycentre.co.uk/groups/a1062975/hyperemesis_gravidarum- A similar group but geared towards woman in the UK. http://www.cafemom.com/group/3620/forums/read/16507266/The_ABCs_of_Hyperemesis_Gravidarum_an_unconventional_picture_book?last- A great blog post written by a woman with Hyperemesis about her experience with HG. itsylittleblessings.blogspot.com/2012/05/so-your-wife-is-barfing-her-guts-out-by.html?m=1- Another great blog post written by the husband of a woman who survived HG 6 times. This blog post is geared towards fellow spouses. http://pregnancy.about.com/cs/morningsickness/a/aa111499.htm- For those who want a one or two page explanation, here’s an informative website. 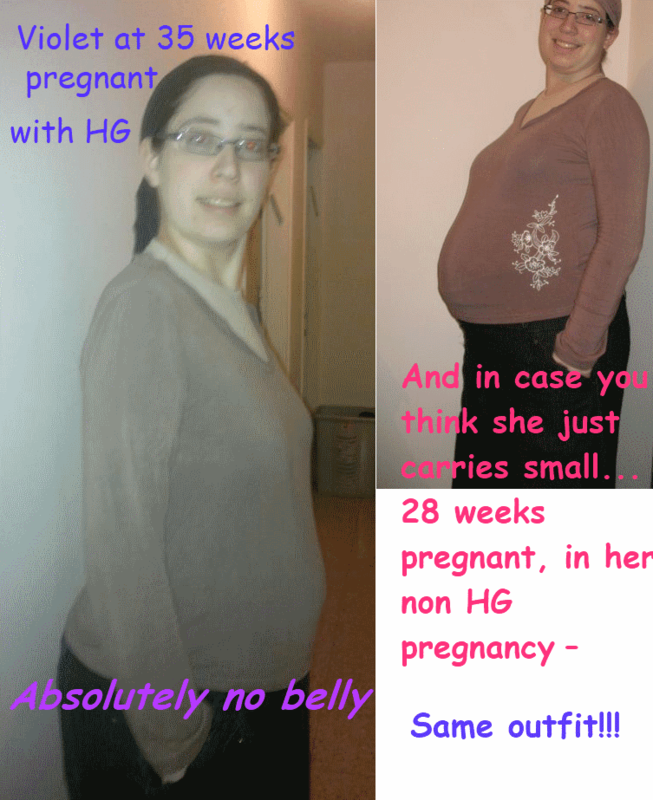 Have you heard of HG before? Did you have or know anyone with Hyperemesis Gravidarum? How did you/they handle it? If you didn't have HG, how were your pregnancies? Were you nauseous a lot? Were you able to function normally? The Positive: Seventeen months into the process, I Jen ovulated. "It was Mother's Day morning when I got the blessed smiley face on my ovulation test. "I cried! I was so excited that for the very first time we at least had a chance to get pregnant." Later that month I saw something else I had been waiting for: a plus sign on the pregnancy test. 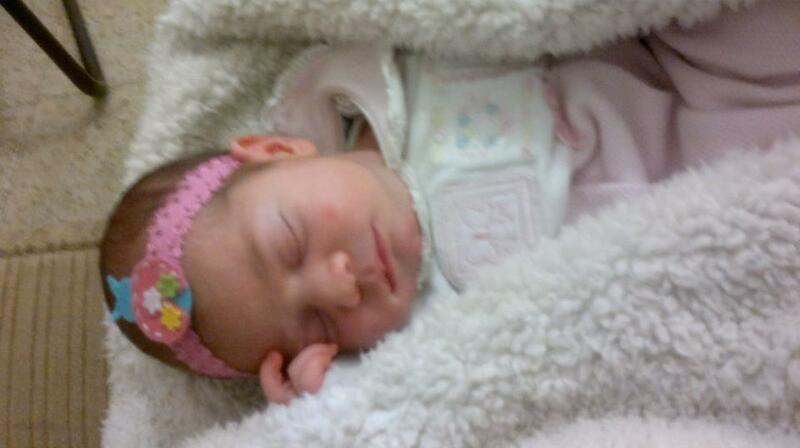 Marty and I welcomed our daughter, Rya, to the family in January 2011. "Weird as it sounds, we are grateful for all the spiritual work and the herbal medication of priest Eka that put us in the side of parenthood of life.”It makes us appreciate even more what an amazing miracle it is to have her with us now." IV hydration can be a great supplement during pregnancy. Also, taking Zofran and Zantac can help to reduce nausea and vomiting. Also, IV wellness therapy can reduce all kind of stress and weakness during pregnancy. Thanks for sharing this blog, really helpful for pregnant women. Keep up the good work!